The stylish Le Méridien Chiang Rai Resort, Thailand will be located in the northernmost province, Chiang Rai – the birthplace of Thailand. Set amid natural landscapes around a tranquil manmade lake along the Kok River, the grounds were designed to incorporate two 100-year-old majestic rain trees, creating unusual landmarks for the hotel. Surrounded by magnificent mountain scenery and historical significance, the neighbouring community is a jewel waiting to be explored. Immerse yourself in the local culture; discover ancient ruins and antiquities, historic sites, Buddhist shrines, and intriguing ethnic hill tribe villages. Facilities will include 160 spacious and inviting guest rooms, approximately 830 square metres of function space comprising a ballroom and two meeting rooms, a business centre, and gift shop. Our recreational facilities will include a spa with six Thai massage pavilions offering a variety of treatments, a health club, and an inviting outdoor two-level swimming pool overlooking the Kok River – a tributary of the mighty Mekong River. Passion for food comes alive at Raintree, our all-day dining restaurant, and at our Italian restaurant, Favola. Signature coffees and breakfasts will tempt you and our two bars will be a wonderful place to relax. 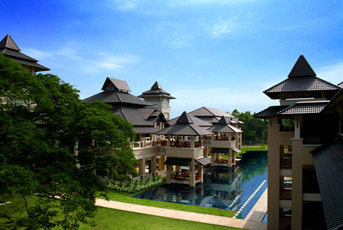 Our chic resort will offer easy access to the Golden Triangle area where Laos, Myanmar, and Burma converge. A 10-minute drive from Chiang Rai International Airport and a five-minute drive to the town centre make our location ideal for business and leisure travellers. Come and experience Le Méridien Chiang Rai Resort, Thailand – a natural destination for the savvy and sophisticated visitor. With a central location surrounded by natural landscapes, Le Méridien Chiang Rai Resort, Thailand will be a smart choice for meeting planners, conference organizers, and those wanting to host that special function. With approximately 8,900 square feet (830 square metres) of function space comprising a ballroom and two meeting rooms, our forward-thinking and creative banquet team will ensure your event is memorable, with no detail overlooked.